After being rejected from 11 colleges Becca decides to try to make it as an actress in Hollywood. She drives out west with her boyfriend who will be attending Stanford. The two have made plans to meet halfway between their new homes on a regular basis but when he drops her off, Alex tells Becca that he believes they should take a break. Heartbroken, broke, and all alone Becca tries to live her dream in a rundown apartment. Luckily, she has the help of two neighbors: Marisol, another aspiring actress who gives her lots of hints on what to do, and Raj, a student at a local film school who hopes to be a screenwriter. With money running out fast Becca has to navigate her way through the confusing world of stardom where you have to have an agent to get an agent and you can't get anywhere without expensive headshots. 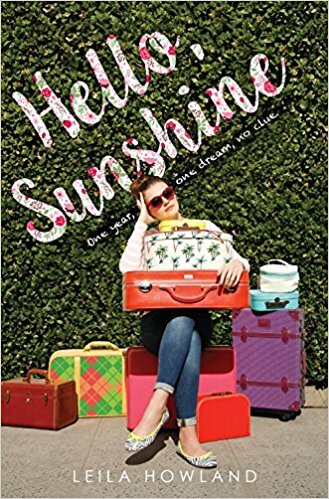 I kept waiting for Becca to fall on her face with her lack of expertise or for someone to betray her but this book really was sunshiny, which was exactly what I needed. I was just looking for something fun to read that didn't take much or any brain power and this fit the bill. Becca is definitely naive about making it in Hollywood but she was willing to learn and work hard. Her ascent to some breaks was still a bit accelerated, but we did get to see her paying some dues along the way. Her two new friends are loyal and so helpful without being secretly jealous or bitchy which was also surprising. There's not a lot of arc to this story nor much conflict, but it is light and fun which is what you need to break up the apocalyptic dystopias at times.